Update: 20:55 It looks like Benjamin now thinks that the logo maybe just a generic Dharma one. Thanks to Benjamin for the following. Benjamin is hoping Menang Ceme to maybe get a better photo of the new Logo and a description of it. I am in the team of the blog “http://lost-spoiler.over-blog.com” and of the lembaga “http://lost.forumsactifs.com“. Richieleb of our lembaga takes to us of Hawaii of the reports of exclusive filming. There are 3 photos with this set report. Sorry for my English but I am French ! lol ! “Hi all, how lucky I was to have spent time with the production team to see Hurley, Jack and director Jack Bender to three feet, and staying a little longer in the rain, I think I saw that Claire, as on one of the photos I took (I had not noticed) by the larger team blog, we see his name appears with that of Jack. Jack is left for 15 hours, and if you go on the blog to see the pictures, the picture where we see two tents covered, and well into 15 hours, he stood there a dozen technicians and a big vision-pana rail close to film a scene from the little camp, I’d be Claire who attended the scene, security told me to go away because the scene had too many new things. One of the scripts that came to see a technician special effects, talking about fire. If you looked at the photo of the camp left one can see a kind of book with a Dharma logo. On October 21 around 13:30 am if returned, the team was filming in a protected area for two or three hours I saw no one. I took other pictures, the camp had changed his appearance. A new sign dharma down, and one can see inside the shelter. It has pictures of trail or Jack and Hurley were filmed. Jack Bender with the cameraman who kept a small Panamanian hands vision, micro understood, and Hurley and Jack stood in the place where we see a large rock in the middle of the trail. It was difficult to see because at 10 feet there was a small tent with two women who had their film scenes. And I was standing behind with two technicians and one that blocked the path to other foreigners (those who visited the park) while they were filming. I think they took the views in both directions. Hurley and Jack wandered down. The other photos are those filmed the trail, a place especially with large trees should be easy to recognize in episode six that technicians confirmed to me. For an hour or more technicians who attends the scene, were brought from the ends of branches with leaves to hide the iron bars that you see on the edge of the trail. Today we got another filming update from our good friend Ryan out in Hawaii. Today’s set report is a about a very interesting scene with Hurley, Locke (in a wheelchair) and perhaps Abaddon!! 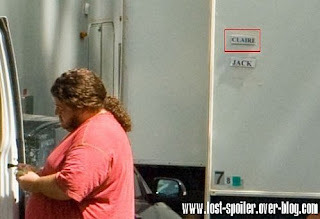 “LOST” returned to the campus of Windward Community College in Kaneohe today to film yet another scene at the “Santa Rosa Mental Institute,” where our dear Hurley (Jorge Garcia) has been a tenant. Hurley is relaxing on the hospital grounds, sitting on a bench and painting, when Locke (Terry O’Quinn) arrives. Locke is in a wheelchair with a cast on his right leg, rolling himself up to Hurley’s side. They have a conversation. Soon enough, Hurley jumps up. He calls out to a female orderly, perhaps his attendant, named “Susie.” He asks her, “Am I talking to a guy in a wheelchair right now?” She affirms that Locke is really there. Hurley sits back down, and they talk some more, in even more hushed tones. Locke eventually gestures over his shoulder at someone. It’s unclear whether this person is standing nearby, or is sitting in a mysterious black car with California plates parked in the distance. But from the context (and the stand-in on the set), chances are Locke is pointing at Abbadon. Susie takes Hurley by the arm back into the hospital, leaving Locke behind.